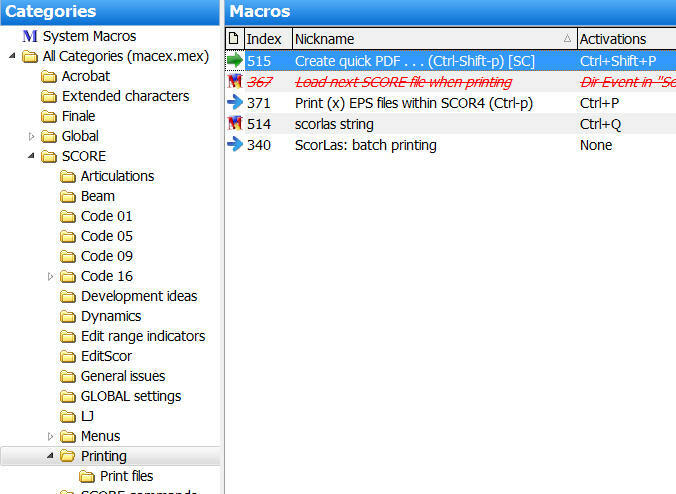 If you use another utility for converting Score EPS files into PDFs, you may still benefit from this macro by modifying its content to suit the requirements of that utility. If you do, please submit your macro for sharing on the Submissions page. “strip.exe” eliminates illegal “statusdict” commands from some EPS files whose page size exceeds a certain amount (I don’t remember at which point this becomes an issue). On such pages, the EPS files cannot be properly distilled. Removing illegal “statusdict” commands resolves this issue. Don’t worry about it; just employ “strip.exe,” which produces 100% predictable results. If you don’t have “strip.exe,” it is included in the download file. Be sure that “strip.exe” is placed on your path, as indicated in the “path.txt” file inside your ScorBox support directory. This macro enables the user quickly to create a single-page PDF of any open Score file in order to obtain a better on-screen preview of the appearance of the page (of course, you can always print that page out, if you wish). One consideration in order to ascertain that this process will work each time this macro is invoked is the file nomenclature, first of the EPS file created by Score, secondly of the PDF created by Distiller. It would not be practical to create an EPS file with a nomenclature reflecting the Score file being distilled: if the open Score file is 100.MUS, you would not want the EPS file to be called “100.EPS,” as doing so would lead to warning prompts (“file exists”) if you would want to invoke the macro several times while working on the same file. You would then have to overwrite the existing file, or manually change the nomenclature. Instead, it was seen as more practical to create a unique output file name each time this macro is invoked. This is accomplished by taking the current time and assigning that, as a name, to the output file. As time constantly progress, this accomplishes two things: 1) no existing file will be overwritten by the new file, and 2) one can easily spot working progress among multiple PDFs created from the same file, as their file nomenclature indicates the order in which they were created (as it reflects the time of creation). Note that both the EPS files as well as the PDFs are preceded and followed by a Dollar sign; for example: $100911$.EPS and $100911$.PDF. I designed it this way purely for convenience: while you can certainly keep the PDFs and EPS files generated for future use, for me, PDFs generated by this macro are mostly for temporary use, and I want to be able to discard all of them quickly in order to avoid clutter. Because of their nomenclature, deleting these PDFs and EPS files is simple: del $*$.EPS and $*$.PDF, and all such files are instantly deleted. 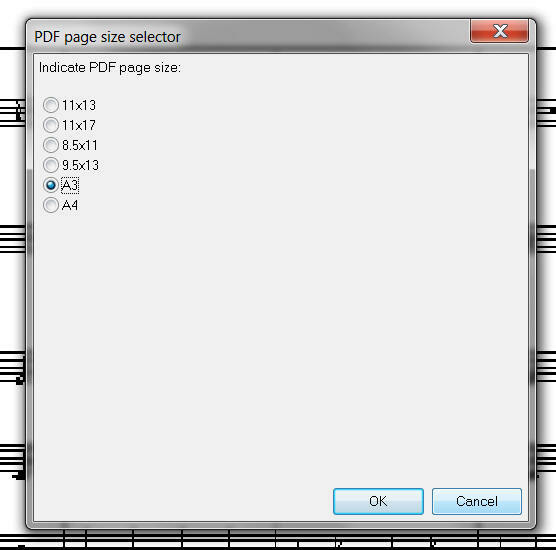 Simply select the one you wish to use for your PDF page, and your PDF is instantly created. Note that the macro remembers your PDF joboption choice, so that if you wish to create several quick PDFs of the same page, you don’t have to select the same joboption each time; this speeds up the process. Before you invoke this macro for the first time inside your current working directory, you’ll have to load, or define, the print specifications in Score’s print screen. Of course you only have to do that once, as it will remain loaded until you change it. Finally, this macro creates two support files that will be placed inside the ScorBox support directory, as specified in Environment User variable %ScorBoxSupportFiles%: “Last-PDF-size.txt” and “PDF-joboptions.txt”. The latter was already described above. Once you define it, you should never have to change it again. “Last-PDF-size.txt” simply keeps track of the last joboption you selected. That option will then be preselected when you run the macro again. You don’t have to do anything with that file, as the macro updates it itself and then accesses it on the subsequent execution.